I kept bouncing around from jobs to courses, not knowing what I wanted to do, until I found the Princes Trust and they helped me to get on the Talent Match Programme. I still didn’t really know what I wanted to do, so I went on any course that I could to find something I enjoyed and was passionate about. Finally, I heard about The Youth Assosiation just as my time on the pogramme was ending and so I became a Talent Match Ambassador, which then gave me another 2 years of support. 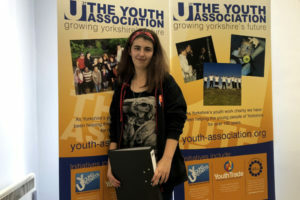 Being an Ambassador meant being a voice for other young people on the programme and while working with the youth workers I found my passion and what I wanted to do with the rest of my career. I’ve seen a lot of changes since I first started; I’m happy and proud to have been a part of it. Some of the changes I’ve been apart of are the creation of our social calendar, getting residentials, inspecting the programme and (going right back the the start) being a part of a consultation which told us about young people’s views and their top 5 priorities for Talent Match. I’ve changed a lot since I started on Talent Match; I’ve gone from not knowing what I wanted to do, to having at least a rough plan for the future to become a youth worker. I care more about my appearence now, dressing more like a “girl” instead of going places in joggers and baggy jackets. I even ‘thrift flip’, so I basically take people’s old clothes and turn them into something new. I guess the biggest impact the progamme has had on me is my confidence. That might sound an easy thing to say, but it really has. Before Talent Match I wouldn’t even ask anyone on the street for directions. Now I can say I have done two different types of security work; concerts and retail work. Probably everyone who has shared the same journey as me could say the the same, as in how much more confident they are now. I’ve grown as a person, and I’ve watched others grow into amazing young people, all thanks to Talent Match and The Youth Assosiation. It might seem like a lot of fun, games and socialising, but its more than that. It’s about friendships that turn into support; it’s about feeling valued and appreciated and yes, of course, we’ve learnt some practical, functional and life skills, for example cooking on a budget and independent living. I’ve recently finished my 2 years as an Ambassador and I’m now doing it voluntarily. I’ve been with the Talent Match programme for nearly 4 years now and have become an Alumni member where I can still work alongside staff and young people and have a say about the programme, but also do what I love doing. I think it is extremely important that young people have a voice in the decision-making process. It’s their life after all, they know what they want and need to progress. I’ve had the chance to make changes and improvements that directly affect me and the young people that come after me. So what I am trying to say is that when it comes to programmes like this, the true power of partnerships is that they work. When young people truly work together they can accomplish anything.